To learn more about MAIW or to become a contributor, visit our website at http://militaryaiworks.com. NOTE: If an uninstall is desired at a later date, only the aircraft and flightplans will be removed. All scenery files, including AFCADs, will need to be removed manually. NOTE: Failure to remove these duplicate files may result in problems with AI aircraft parking and operation. It is recommended you move these to a temporary folder instead of deleting them, however, you should not need them again as the AFCADs included in this package are thoroughly researched and highly detailed. 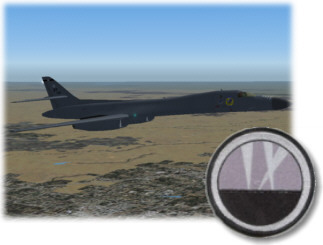 If you are using addon scenery for one of the above airfields, it is recommended you do NOT remove the AFCAD for the addon scenery, but instead remove the MAIW AFCAD file (e.g. MAIW_KXXX_DEFAULT_XX.bgl) after installation. 3a) If you don’t have the EditVoicepack 3.1 freeware installed, download it and install it by clicking here. That’s it! You’ve successfully installed this package. Fix action: In FS9, set the AI traffic density slider to at least 60%. Files may be named in several ways. The most common are “AF2_KXXX.bgl,” “AF2_KXXX_DEFAULT_XX.bgl” and “PAI_AF2_DEFAULT.bgl.” Keep the files named “AF2_KXXX_DEFAULT_RM.bgl” and remove all others with duplicate airport identifiers. This package was built by the Military AI Works online community. 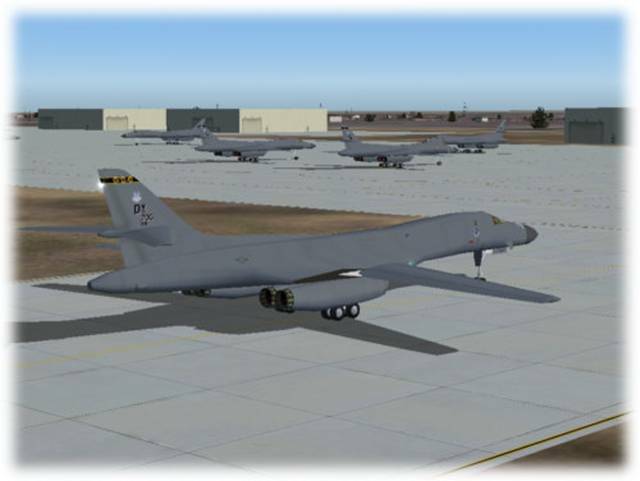 If you are interested in making Military AI traffic more realistic, visit this site! The flightplans are fictional, but yield realistic appearing operations. I’ve tried to keep everyone happy by balancing the flights time hours with a large majority flying early morning and late afternoon. Bomber aircraft typically fly in 2-ship or 4-ship formations. While much research and experimentation has been done to allow AI aircraft to fly in formation. I decided it would be impractical for the general user to include these techniques because of their potential instability and impact to non-military AI traffic. Instead, fighters in this package are assigned to a 2-ship or 4-ship which will depart and arrive at the same time. These aircraft will taxi together, but will still fly as single ships and take off and land in sequence, not in formation. 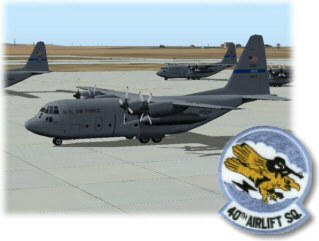 For the Herks, I chose to simulate a couple of training deployments to Army Air Fields to pick up paratroopers and a couple single ship training missions including low level flights, hopefully everyone will be pleased. All flightplans were created using the yRoute freeware AI traffic editor and tweaked using a text editor to remove spaces and unwanted characters. 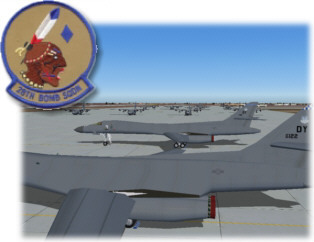 Flightplans were installed using Lee Swordy’s TrafficTools freeware traffic compiler. The callsigns used in this package are actual callsigns used by these units based on information found online here. While squadrons generally use several different callsigns for training missions, I have included only one for each squadron for simplicity’s sake. All callsigns were created using the ingenious EditVoicepack freeware. 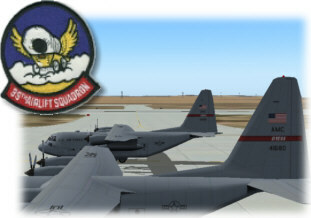 This program is extremely simple and fun to use—if you need a new AI callsign, give it a try! All AFCADs were created using Lee Swordy’s AFCAD v2.21. This has got to be one of the finest freeware programs ever created. Want to add some AI parking to your local airport? AFCAD makes it fun! The contents of this package should not adversely affect your FS9 or computer operation if installed according to the instructions. The authors make no guarantee and bear no responsibility for adverse operation or lost/overwritten files on your computer. THESE FILES MAY ONLY BE UPLOADED TO AVSIM or FLIGHTSIM.COM BY THE AUTHOR. Upload to FSPLANET.com will never be allowed by Military AI Works or World of AI. All information used to create this package was obtained via online, open-source research. All flight plans and schedules, while reasonable for military units, are fictional.